Amazon.com is expanding the reach of its Kindle ecosystem still further, announcing a new Kindle for the Web service that enables users to sample Kindle titles without having to install any special software or own a Kindle-compatible device: the Kindle title loads right in a Web browser, and Kindle titles can be embedded directly into Web sites. The Kindle for Web service enables users to change the display size, line spacing, and background color of material displayed in the fewer, as well as easily share links to Kindle titles via email and services like Facebook and Twitter. Kindle for the Web is being billed as a beta release, and Amazon is promoting it heavily to Web site owners who are members of the Amazon Associates Program and who are trying to sell books to their visitors via Amazon: using Kindle for the Web, Amazon Associates can embed the first chapter of a book directly in their site, and then hand customers off to Amazon if they make a decision to buy. 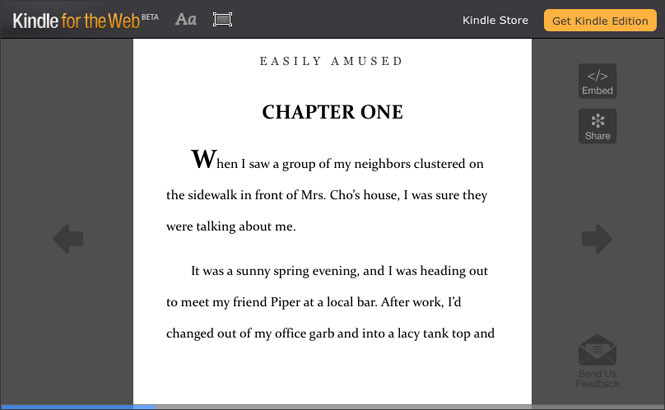 Selected Amazon book pages will also have a “Read first chapter free” feature that will tap into Kindle for the Web.